Happy, “Ana finally took pictures” day! Tuesday consisted of a lot of walking, and a lot of eating. Pretty good day, right? Right. We began with a North-End walking tour from Boston Pizza Tours, and saw things like the only Irish pub in Little Italy, the Leonard P. Zakim Bunker Hill Memorial Bridge, the original Regina’s Pizzeria, Copps Hill Burying Ground with the gravesite of some dudes from the Salem Witch Trials, and also Robert Newman, the guy who actually lit the lanterns to signal Paul Revere to start riding, the skinniest house in the world, and of course the Old North Church. I think the girls enjoyed walking around the city, and the tour guides were great at making the stories interesting and engaging. The tour ended in a park where pizza from Regina’s was waiting for us. And I have to say, as big of a fan as I am of Chicago Deep Dish, this was really good pizza. We walked from there to a few of the famous Italian bakeries in the area. The girls were excited to try Cannolis, something very few of them had had before. I had a chocolate Ricotta one, and it was amazing. Whenever you go somewhere with a lot of Girl Scouts, especially when they’re all wearing the same t-shirt, you tend to get noticed. A really nice lady named Maria was helping us at the bakery, and she didn’t even mind when the girls were indecisive and took longer than expected to complete the order. When I went to pay she said that she loved Girl Scouts, always bought the cookies, and had some nieces in the council here. I always love hearing people’s Girl Scouts stories, even if they’re not scouts, they usually have had a good interaction with a Girl Scouts at some point in their lives. It just makes me happy! Next, we went the the New England Aquarium. It’s set up really cool, there is a giant tank in the middle that goes straight up through all four floors, filled with all kinds of fish, rays, reef, turtles, and even sharks. Around the tank is a spiral ramp, with smaller tanks on each level with other creatures to see. On the lowest level, in an enclosure all around the big tank, there are penguins zooming around under the ramp. So you can peek over the rail on any level of the ramp and see the penguins. In another section there are two touch tanks, a big one with rays and a smaller one with crabs, sea stars, and other crustaceans. There are also seal and sea lion shows. As a special part of our trip, we went on a behind-the-scenes tour of the third floor tanks. In small groups, we went behind the wall and got to see how they feed, clean, and care for the creatures in the tanks. We also saw holding and quarantine tanks, and got to touch another horseshoe crab and lobster. We learned about how the water used in the salt water tanks are from the Boston Harbor, and recycled many times through it. We also learned a bit about the green technology used at the aquarium through the behind the scenes tour and the “Big Tank Talk” after. Due to tour timings, we were in the aquarium for most of the afternoon. We saw the fur seal show, and then left to tour and eat dinner at Faneuil Hall, a revolution-era marketplace, now filled with stores and restaurants galore. I don’t know too much about it’s history, but the wikipedia page is pretty interesting! We had these great vouchers that the girls could use to get certain meals from the vendors, and also a dessert. 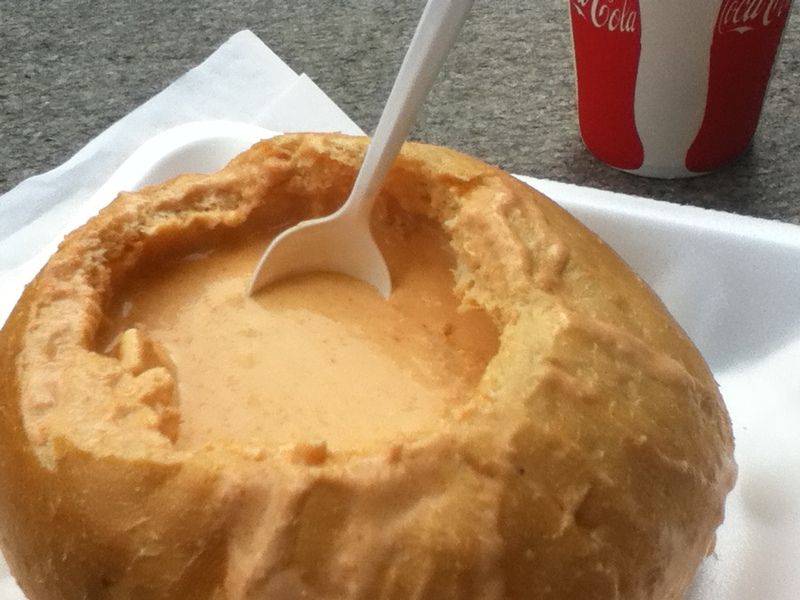 I had lobster bisque in a breadbowl, and a really great smoothie for dessert. It was great to just hang out and people-watch in the busy hall. The girls grouped up and went shopping, and it was also great to see them, after only three days together, laughing and running around together like they were BFFs. Of course, not everything ever runs perfectly at a Girl Scout event, either with logistics (no matter how much you plan) or with the girls. But the issues that we have had have really been minor so far, and the other girls have been AMAZING at stepping up to be a buddy with someone feeling down and adapting to a changing schedule. I think we got some great girls here, and I hope we can renew some of their interest in Scouts and help them take full advantage of the wonderful program. Well, I’m about to go to the beach, so I will try to post again tonight, please comment if you have questions and don’t forget to subscribe to get updates in your email!! Volunteering at the National Convention with my mom!